Where do I start? It’s hard to believe… almost unimaginable, that it has been a decade since we lost Jeff. March 2nd has always been a difficult day, filled with sadness as we think of him. However, continuing to remember him throughout the year and the joy he brought to us, always helps to soften it. After 10 years, his memory still lives on in our hearts and in his music , which we are blessed to have forever. I try to remind myself that Jeff was about living, always. That is exactly what we’ve been doing. Part of that has been making sure his family, friends and fans continue to have the opportunity to hear his amazing performances through ongoing projects. Over the last few years, I’ve had the chance to discover new music of Jeff’s that I had never heard before. Thanks to the incredible vision and dedication of Roger and the entire team involved, I was delighted that we were able to share these astonishing works with all of you. On the family front, Jeff’s daughter has grown into an incredibly accomplished young woman, our son is now 13 and I think they love their father’s music just as much as we do. It’s been so important to me that Jeff’s work is available to his children. Not to sadden them, but to help them never forget part of what made their father the beautiful person he was. Since his passing, I’ve had the privilege to learn how much his fans care. You have been so supportive and always ready to hear the next new surprise we have in store for you! Your continued loyalty has encouraged us to keep finding new ways to remember him and I thank you so very much for that. There are so many times we wish Jeff could’ve been here to see the appreciation shown for all he contributed throughout his lifetime. Some of those occasions include the induction into the Terry Fox Hall of Fame, the naming of Jeff Healey Park, a star on Canada’s Walk of Fame and most recently in 2016, a star on The Mississauga Music Walk of Fame. Jeff always managed to inspire people and the impact he made on all our lives continues. With that in mind, let’s take today to remember Jeff. Remember all he accomplished, all he shared with us, and all he still encourages us to be, despite leaving us far too soon. Jeff Healey was and always will be a huge part of my life. I started playing guitar in the same style as he did, right after hearing the “See the Light “ album for the first time. The impact made of hearing this album was unforgettable. I’m a huge admirer of his work, the man himself, and his gear. He took playing on a Stratocaster to a whole new level. His sound in the “Healey in Halifax “ footage was some of the biggest I ever heard. Next, the “Live in London “ footage, followed by the “See the light “ album are my favourite moments to hear him make that guitar scream. Raw Blues Power at its best. Canada had the best. No one can replace the best. I rest my case. 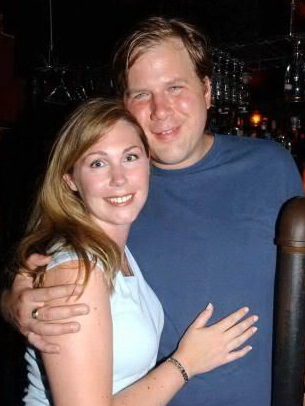 Seen Jeff Healey Band at the Misty Moon in Halifax….amazing performer….amazing musician…..still live his music. MAY HE RIP! Thanks Cristie for the loving words on the anniversary of Jeff’s passing.You would know how many people across the globe miss this Legend For me,it’s the reason that I do Radio,and continue to try and play the music that we love.In my 71st year,playing the Blues with my good friend Brad on CBG’s(Not Brill,But luv’ it just the same).Keeping in touch thru his website is great for me,so to you,your family & Rog’Thank You for all that you do.Best rm ‘Down Under’Tecka’ Terry Iredale Tecka’s Rock & Blues Show on CRN. A great version of While My Guitar Gently Weeps, composed by George Harrison, Sady missed. I’m in Edinburgh, Scotland. My Daughter has chosen his Angel Eyes song as their first dance song. His music is stilled played in our house. Beautifully said Cristie, it’s still hard to believe Jeff is gone period, let alone 10 years now. Hearing him on the radio just about everyday helps to keep him alive, along with wonderful memories far more appreciated today then at the time. All the very best to you and your family, you ladies have done a wonderful job raising Rachel and Derek. Jeff would be very proud of all of you. God Bless and have a great 2018..
Lovely words Cristie and I think I can safely say that Jeff’s memory and his legacy is in safe hands and the work that you do, assisted by Rog to keep the flame alight is truly appreciated so from one of your many friends from across the pond can I say thank you both and thank you Jeff for all the great music we miss you man! Bless you for keeping his legacy alive! What a blessing to be able to hear his voice everyday! NOONE COMPARES, Love ya Cristie. Hope to meet you someday! Jeff has been a HUGE PART of the soundtrack to my life, and I miss his talents immensely. It’s wonderful that Roger always makes it a point to keep Jeff’s name relevant. With such a treasure trove of material, my Ipod plays Healey music every day. Keeps me sane. March 2nd 2008 was a day that still is very fresh in my mind and always be with me.I was a very young Jeff Healey fan when I first discovered him through the See The Light Live From London performance that my mom had taped from the tv broadcast. From that very moment that I first saw him being as young as I was at 6 yrs of age…I knew he was different and I also grasped the fact that he was blind but I didn’t understand what blindness was all about until my mom told me that he couldn’t see anything and the fact that he couldn’t see quite honestly scared me so I would tell my mom in a frightening tone “Turn it off,turn it off”…But something always had me curious about him,his style of playing and the fact that he did it all while being blind had me coming back for more…Needless to say that I became Jeff’s biggest fan…would watch the Award shows on tv every chance that I knew TJHB would be on them.I would collect all his albums (except for Cover To Cover…(I didn’t know of it’s release until I got his final album Get Me Some).Anyways when I found out about his death through an email from his fanclub that I was apart of I was immediately shocked and it was like I lost a best friend 🙁 So what did I do to help get over him not being with us anymore…I would play Angel Eyes over and over and over again and to be honest it took me a good year before I finally stopped crying and realizing that he was never coming back…So since then I still continue to collect any dvd’s or music of his to this day…In a way to remember both him and his talents as well as his music by.He will always be missed but never forgotten…Thanks Jeff for the awesome memories that will never fade from my life. And that’s my Jeff Healey story…Hope you enjoyed reading it. I was lucky enough to spend some time with Mr. Healey after a show in London. He was very accomadating and friendly. I asked him for advice for a young fledgling guitarist and he told me to “Stick to the saxophone” I still laugh thinking about that night. He influenced me in many ways that changed my life and lead me to have many adventures playing blues around the world. We are all so lucky to have his music to embrace.I was so sad when he passed but we should all be happy that we have his legacy to share. I have always been and always will be a devoted fan. I was blessed to see your husband perform in Dallas at an SRV Ride and Rememberance. An added thing I’ll never forget is watching him ride the mechanical bull after the show !! I was blessed to meet your husband after a show in Charlottetown and thank him for the many chills he sent down my spine over the years. Still one of my all time favorites! He even autographed a poster for me, but I lost track of it over the years. Well said Christie Your husband was a amazing person and music artist I’m so greatful had I had the pleasure to see him play and sing He will always be remembered in my heart ! God bless you and your family. Still listen weekly. Sometimes daily. Never gets old. Was fortunate enough to be front row center when JHB played Syracuse Symphony Hall early 90’s. His playing was mesmerizing. I was awestruck. 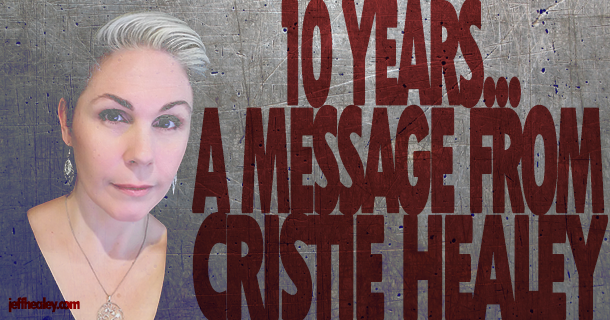 Thinking of you all today, Cristie – and we’ll be listening tomorrow night. We have so much to thank Jeff for – including bringing us all together through his music, his friendship and his generosity of spirit. I had the privilege of seeing Jeff & his band live in Wellington New Zealand performing their last concert of the “See The Light” world tour. We watched Road House the other day. He was a very talented man. I’m very sorry for your loss. He looks over your family…I have no doubt about that. Hold tight to those memories. Know he made a difference and touched many lives. My condolences on this anniversary. Thanks for your note letting us know how you and your kids are doing, Cristie. Jeff is watching over you all and I know he’s proud of you all, for what you all are today, and for all the wonders that are to come. As sad as I am that Jeff is no longer with us, I’m glad to hear your kids like the musical door that dad has opened for them. Who knows, maybe one or both of them will take up music, if that’s what they truly love in life – I know you and Jeff would not want it any other way. I tip my hat to you Cristie, for being strong and carrying on for your kid’s sake, for yourself, and for Jeff. Though I never knew the classical and jazz side of Jeff, it was always his extraordinary work with his bandmates Joe Rockman and Tom Stephen, his passionate and heartfelt words of wisdom, channeled through his stellar guitar work, that made me realize early in Jeff’s career just how much a blind man can really see; frankly much more than most of the rest of us ever will. And he gave it right back to us. Jeff gave us all so much of what he saw in his time here – love and music, all in abundance and without hesitation. This to me is the definition of a true legend, one whom will never, ever be forgotten. Peace, and God bless. I was at the Joe Coker show years ago at the ACC, and saw you and Jeff walk by, I poked a friend I was with an said “Hey there’s Jeff Healey” I was shocked when you came back and handed me two tickets to his house of Blues! Such a wonderful gesture! We also saw him in Ottawa at the Central after coming from seeing Dan Ackroyd at the NAC! What a great night of Canadian blues rock at its finest❤We are blessed to have his music live on! Hi, I play guitar and was inspired by Jeff many years ago. Just another gig story but, I was into SRV and blues/rock guitar and seeking out great players. I had a chance to see Jeff in his early days at a small venue in Cleveland in what was called the Flats area. It was full and his sound was amazing. I had to get close to see what he was using. Seeing his play guitar on his lap was amazing. As a guitar player trying to figure out licks ,this was amazing to watch .He was flying on his guitar ! The final number was the Hendrix cover Watchtower. I drove home that night thinking I need to close my eyes and listen to guitar. In the 80’s World of hairbands,scale players and funny sounds to me he was something else to see and hear. The real deal. I have since played and recorded for 30 years. He is still one of my most memorable shows and inspirations. Jake in Pa.
Just finished watching the movie Road House with Jeff, staring along side Patrick Swayze and Sam Elliott. Will be airing again on Texas time zone on March 10th at 2pm CMT (327) and 730pm. I loved hearing him play. A TRUE ARTIST!! What a way to honor your Husband Jeff, and father to your children, a loving and heartfelt note to fans.. I really got on this fb site because I liked his music alot and learned so much more from his fans and the music I got to hear…thank you to you All. What a great legacy. …I think I was at that same show at the Casino “Rob”,I think it was somewhere between like 97’or 98′, maybe a bit earlier?? He rode in the Limo I rented, I jammed with him to some Cream CDs after the gig on his Travel Truck/Bus….he was so down to earth and personable….and as good as they get… RIP Jeff -(BAM). Just wanted to mention that I not only listen to Jeff a lot and adapt some of his techniques to my playing,I also think of things he has said in the past. I also recall several instances when Jeff would demonstrate to not take yourself to seriously. The funniest, to me, was when when he altered a line when performing “I’m gonna sit right down and write myself a letter”. He changed a “the” to a “my” so the line became “lots of kisses on my bottom, I’m so happy that I got ’em! I saw Jeff three times in 88-89 and still pull his music out. Somewhere I have a bootleg recording of him playing at the first show I saw him at; Mississippi Nights in St Louis, MO. My band started playing While My Guitar Gently Weeps recently and it was Jeff’s version we pulled up to learn rather than the original. Unbelievable talent, wish he was still with us! Thoughts with you and your kids at this time. Love Jeff’s music, hope it is always available for everyone to listen to. Saw Jeff play in SanFrancisco warming up for ZZ Top. An amazing talent, we were so blessed to have him in this world. Hope to see him playing in heaven. What a curious world now – I love listening to this guy – I thought he died last year or something.. I listen to his show on Jazz 91.1, on just after the Dinner Jazz prgm, which we have become addicted to. Listening to his prgm Apr. 25, 2018, and Jeff was talking about a gig he was doing – and I realize I am hearing history.. it is a bit surreal. He spoke tonite about Toronto “music nazis” who say no-one wants to hear old Jazz from the 1920’s.. I thought “Damn! I love this guy!…” and just for the hell of it, I googled his name,and found that he had been dead for over 10 years! (I feel like a dumb kid who has just discovered David Bowie… or Townes Van Zandt…) I’m glad they put Mr. Healey’s program on the air – it is fine music. We have to realize what the 1920’s really was – the first time in history where the world made this wild phase-jump from the past into the future – it was wilder and more dramatic than anything since maybe the immediate post-war (“Atomic Cafe”…) world. Our poor, sad world is so tired and exhausted now – there has been little but bad and sad things happen in the last 20 to 30 years – but listening to the music from the 1920’s and 1930’s shows such a different picture of the future – bad times now, terrible times ahead, but eventually, an amazing bright-white future. We don’t have this in music now. It’s all either formula, or just mean noise. But when you hear the old stuff, from the 20’s and 30’s, it is just wonderful. Reaches out and touches your cold black heart, no? Thanx for putting this website up. Between Townes Van Zandt, Tom Petty, David Bowie, George Harrison, Muddy Waters, and all the really old stuff, etc. – the music I listen to – (and now the radio programs also! ), it is all dead guys and this high quality stuff… Kinda strange… like being on another planet, and tuning into transmissions from a star-system 100 light-years away – you know everyone you are listening to has already died long ago… sorta Star Trek, or something. I didn’t know that Jeff Healey was blind. I read all these pages on him – fascinating. Glad he has not been forgotten. Really enjoy his show… my kinda jazz, I guess. I was just relating a story of how I met Jeff and felt the need to search the web and was taken aback that this the 10 year mark. Well, the story is that I wondered into the Lakeview Lounge in Chicago, Broadway just off Foster ave which was around the corner from my Mom’s house. This had to be pre-1985. I sat down at a bar stool in this smallish dive and faced the stage that was ‘behind’ the bar. There he was, this kid playing blues guitar in his lap. His friend was sitting next to me. Jeff was staying with him, he said, and this kid is going places and was going to be big. Huh? Well, he’s definitely good – but, the Lakeview Lounge? He introduced me to Jeff who was very friendly. Not much really sticks out in my memory except that I asked him why he played guitar in his lap. He said he grew up in a ‘home’ – sounding like not with family, but maybe related to his blindness? Anyway, he said someone came to this place and gave him a guitar, but no one had ever showed him how it was supposed to be held to play it. He just thought that the lap was the proper place and learned that way. I’d like to know if anyone has heard or knows the same story of learning the guitar and if there’s other Chicago stories from the early ’80’s. The next time I saw him was in “Roadhouse”. Holy mackerel, that’s that kid! Yes, he was going places indeed! Forever Loved and missed. My 3 favorite songs are Like a Hurricane, as the years go by and When the night comes calling. Earliest would be Angel Eyes. God Bless! to the family! Although I am 12 years older that Jeff was and played guitar longer than Jeff, he was a huge, huge inspiration to me and still is. I admired every note and sound that came from his guitar and voice. I still enjoy looking through Jeff’s sites and watching his videos, but it also still saddens me like the day I heard of his passing. I have been fighting that nasty cancer for 12 years now and hate that disease more than I ever knew I could “HATE”… I can only what a great musician and performer like Jeff would have accomplished if the good Lord would have let us keep him. Thank you Jeff for all the inspiration, enjoyment, and beautiful music. Keep heaven rockin’ but also remember to take a break now and then to rest in peace!!! Im a 48 year old disabled man in a wheelchair and Im a Jeff Healey fan since See the Light was released. I put off learning guitar because of laziness but since this past Christmas-My Uncle bought me an Epiphone Les Paul Standard Plustop Pro guitar and a Line 6 amplifier I have been trying to learn. I would like to know what Jeffs technique for playing is called? Do you know if there are any commercially available DVD’S that teach his techniques? Or if there are any online resources for his techniques? Hey Sheldon! Thanks for reaching out. Jeff was self-taught. Unfortunately there are no DVDs or online resources that teach his techniques. There may be some out there on Youtube and such, but they have nothing to do with us and we can not vouch for their accuracy. So glad we saw you in Islington in 07. 10 years is short compared to how long into the future you will be remembered. Here’s a link to a photo I took of Jeff that night. It turned out to be the last show he’d play in London. Jeff was one of the greatest musician ever, he can seat and play shoulder to shoulder with Jimi Hendrix. But most of all, Jeff Healy was specially touching with his sensibility as he played and also in his relationship with other human being..but you already know that. His music will still play for a long time, and I made it available to my chidren, and now as a GranPa old «pall» of 3 years old (grandson) is able to ask me to put music of Jeff when he cam at home… take care. One of the most natural blues man I ever had the privilege to have seen live! … I play Jeffs music and it takes me to a better place. God bless from Iggy in Princes Risborough, Buckinghamshire, UK. What about the new music? While the music I have enjoyed most of my life had a blues influence, I guess most music does in some way, it’s just been the last 5 years that I have really learned to appreciate blues, blues/rock music. During that time I discovered Jeff Healey. WOW. What a talented individual. I live in Virginia and have seen where he used to play at The Boathouse at Bessies Place in Norfolk. A venue not too far from me. Damn… my loss. He’s one of many talented blues musicians who have left us that I would have lived to have seen. I remember skipping class at NSCAD, drinking with the lads at the ‘Delta Hotel’ just before a gig at the Halifax Forum. Well, Tommy may have been heavy maintenance -on the heels of the ‘Steel Road Tour but, ‘hey’ the show must go on. The lobster and beer after the show didn’t agree with him. You were probably the only one there who knew that. I never saw Tommy again. Do you know if he moved back home here?